I recall seeing quite a few tweets about this on Twitter, so I checked it out for myself. Kimi ni Todoke focuses on Kuronuma Sawako, a high school girl who's pretty much out of touch when it comes to being social. It's not intentional as poor Sawako's appearance reminds everyone of the girl from The Ring (I haven't seen it) and giving her the nickname Sadako. It doesn't just stop there as rumours are spread around about her as a result, such as being cursed by her if you stare at her eyes for more than 3 seconds. Because of the rumours, Sawako is misunderstood by everyone; she simply wants to make friends with everyone. It kind of fails since she doesn't know how to smile, so when she greets her classmates every morning, they end up getting scared. 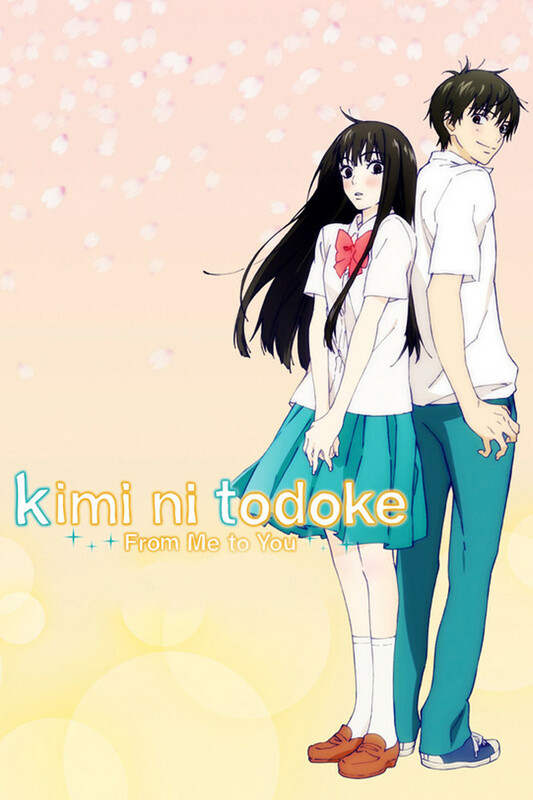 This is shown in the first few chapters, allowing Kimi ni Todoke to focus on the part of Sawako's life where she is able to see change, firstly in the form of meeting Kazehaya Shouta. To her he's refreshing to all those around him as he's able to get along with everyone and treats her like a normal person when they first met. Since then she has always admired him, and thanks to some school activities they are able to talk more, which also paves way for Sawako to make her first friends. This group does grow as Sawako becomes more open with everyone, giving the author more opportunities to expand on the story through other characters. It's a good way to find out why each character is portrayed as they are. What's more, the story takes a more realistic approach in that everyone we meet is progressing through high school, and so they must study hard for exams as well as think about their careers and what not whilst enjoying life in and out of school. Of course there is romance in it too, but even this takes a more realistic approach, making it a really good read. This amount of depth does make it an addictive read, even if you have left the manga for a while and get back into it again. Because of all this, there is a lot of character development beyond Sawako. From high school to romance to life outside of school, everything affects those we get to know through the story. Even background characters seem to have their little time in the spotlight (even if it's just a few lines from one of the main characters) and how they've changed through high school. To summarise, Kimi ni Todoke is a very enjoyable read about a girl who's trying to find her place in life by trying to make friends and finding love whilst doing so. What also makes it good is that any misunderstandings are not dragged out, giving space for more things to be added to the story. Sadly I've read all the chapters which have been translated on the site I read manga on, and as much as I'd like to know what happens next, I must wait. But there is an anime which I found out about a little while after starting the manga, so I have yet to check that out. If you've seen the anime, let me know your thoughts in the comments and how it compares to the manga if you've also read it.